Northants star David Willey took three wickets and smashed the winning runs as England claimed a crucial win against Australia at Headingley on Friday evening. The hosts needed 300 to win after restricting the Aussies to 299 for seven, with Willey dismissing the top three batsmen. And England made it over the line as Willey hammered the ball into the stands to finish the game. It means the two teams are now level at 2-2 in the five-match ODI series, heading into Sunday’s decider at Old Trafford. Willey, who had not been selected for the first three games, got England off to a flyer as he bowled Joe Burns for two. 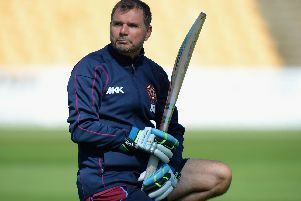 The Northants all-rounder followed that by getting rid of Steven Smith for five, with the Australia skipper caught LBW. And Willey had his third wicket of a blistering spell as Aaron Finch was caught behind to leave Australia 30 for three. Glenn Maxwell (85) and George Bailey (75) helped the tourists rebuild as they posted a competitive total. But Eoin Morgan’s superb 92 laid the foundations for England, and they got home as Willey walloped the winning runs at the ground that will be his home next season.